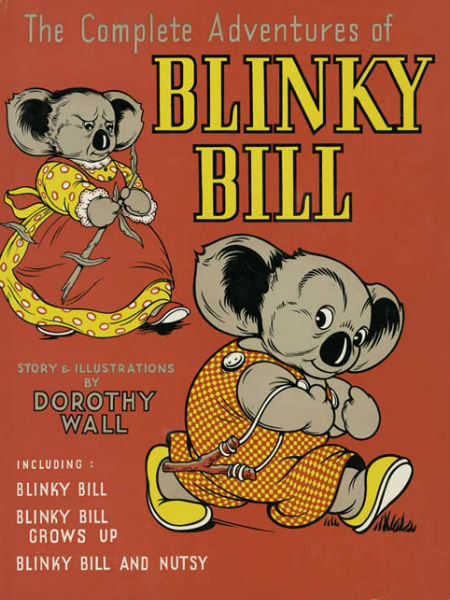 Blinky Bill is an Aussie icon. 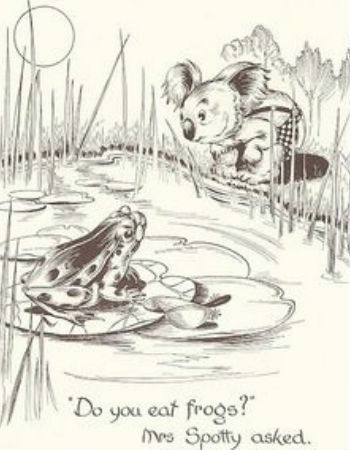 First appearing in Brooke Nicholls’ 1933 book Jacko – The Broadcasting Kookaburra, Blinky Bill was the creation of Dorothy Wall who conjured up a young, feisty anthropomorphic koala who did everything a young boy such as I was then wanted to do. He had a bunch of wonderful friends – Splodge the kangaroo, Flap the platypus, Marcia the marsupial mouse, and good old Mr Wombat aka Wombo (Blinky’s name for him) who acted as the Mr Miyagi of the books – a loving mother and sweet adopted sister Nutsy, and grand adventures in the Australian bush that had danger and fun in equal measure. It was hard not to fall in love with a character like that who got to do amazing things, get into scrapes and escape from them in the nick of time, lesson hopefully learned, who learnt life lessons, albeit grudgingly sometimes, as he did things that any kid would do. In that respect, Wall captured childhood perfectly; specifically what an Aussie childhood could be like. Granted, we didn’t all go running through the bushland, go to fairs with a riot of produce on sale or run away from home, have conversations with snakes or Willie Wagtails (a bird) but we did push things a little too far in our learning about the world, become friends with people who weren’t he best fit for us or influence on us, and delighted and exasperated our mothers in equal measure. In that respect, Blinky was a typical kid and even as I read his adventures – I was lucky enough to have parents who loved reading and so The Complete Adventures of Blinky Bill became, with so many other books, a staple in our home – some 30 plus years after Wall had first published Blinky’s tales in his own books (which by the way have never been out of print), I couldn’t help but identify with the remarkable young little koala boy. I was never as naughty as he, of course – as the eldest child in a Baptist minister’s family I was the personification of well-behaved; well mostly, let’s not get carried away – and lived vicariously through his excursions into places he really shouldn’t go and with people he really shouldn’t be with. But he was loved with Mrs Koala being the best mother a young “rab” could have, and at the end of the day, at the tail end of all the big adventures, home was where Blinky ended up and where he belonged, even if like all kids, he didn’t always appreciate that. What I also loved about Blinky Bill were the conservation messages embedded into every story. It was unusual at the time I guess since the 1930s were hardly a hotbed of radical thought and deed as far as preserving the planet was concerned but it spoke to Wall’s love of Australia and things like “the bush” (the gum forests) and the animals that made it so distinctive. In common with many Aussie writers, such as poet Dorothea Mackellar who penned the immortal ode to Australia My Country with its well-known line “I love a sunburnt country”, Wall a patriot in the original, untarnished definition of the word. She loved Australia, loved its unusual plants and animals, its rugged landscapes and wanted to reflect what it meant to be an Aussie, and most particularly an Aussie kid. Hand in hand though with that, she wanted to make it clear that you couldn’t just take it for granted that all this unique wonder would be around forever; care had to be taken with it or it would be lost and so in books like Blinky Bill: The Quaint Little Australian and Blinky Bill Grows Up, she told stories that emphasised how important a world Blinky, his beloved mother and his friends occupied. As a budding conservationist who loved the books of Gerald Durrell and fretted at the way we were treating our planet and especially the part of it I lived on – Australia has sadly one of the highest mammal extinction rates of pretty much anywhere on the planet – Blinky Bill spoke to me about the need to preserve the Australia natural landscape so Blinky and his fellow animals would always have somewhere to call home. In a sense Blinky Bill and I grew up together. The red-covered book of his complete adventures rarely left my grip and even as I got older, much, much older, I kept it close and it remains one of my most treasured possessions to this day. And yes, even as Blinky Bill, as the trailer above makes clear, has kept pace with the modern world and begat all kinds of TV series and movies, something I dearly welcome given how important it is that he keep discovered by each generation of Aussie kids, I always remember the young koala bear and his adventures as Doroth Wall wrote and illustrated them, and how much they meant to me growing up and how they defined what it meant, even as a young boy, to be Australian.